I would like to thank my friends, artists and overall talented people who have helped me through the years. Bill Traver and the William Traver Gallery team - help with everything! 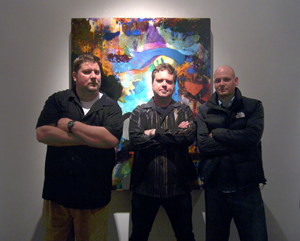 Andrew Glass, Alan Fulle, & Tad Crawford at Alan's "Gem Box 2008 Show" at William Traver Gallery. The three artists were part of the Art Garden group show in Drenthe Netherlands in May 2008.